Audi A3 Sportback Finished in Daytona Grey Specification Includes Exterior Features,Pearlescent paint,Safety,Cruise control,Parking system plus - front + rear,Interior Features,Fine Nappa leather + super sport seats,Trim,Front sports seats,Paint - Pearlescent,Pearl - Daytona grey,Trim - Leather,Fine nappa leather - Black + super sports seats,Rear window wiper,DAB radio,Voice control,Automatic air-conditioning,Central locking,Cruise control,daytime running lights,Electric windows,Heated front seats,CO2 emission: 162 g/km,Fuel cons. combined: 40 mpg,Fuel cons. open road: 49 mpg,Fuel cons. town: 31 mpg,ABS,2x driver and passenger airbags,Alarm device,ESP,Immobiliser,Multifunctional steering wheel,Park Distance Control,All-wheel,4x4,Traction control,Suede cushion,5 seats,Centre arm rest,Divided back seats,ISOFIX Child seat fastener,Leather,Sport seat,Right-hand drive,5 doors,Speed limit: 155 mph. This advert is for an Audi A3, click Audi A3 in Worcester to see more cars like this in the local area. Want to search further afield? 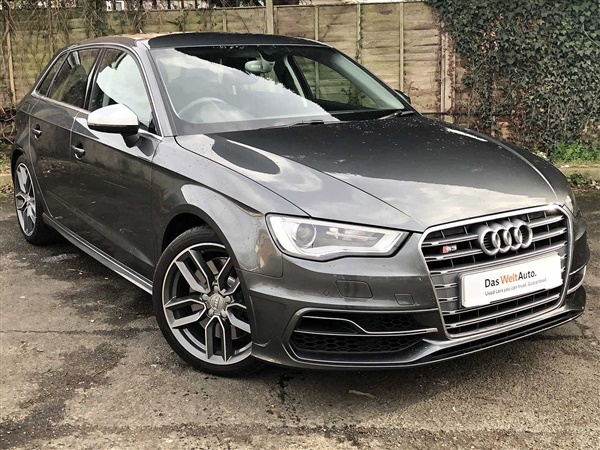 Click Audi A3 in Worcestershire to search for similar cars in the wider Worcestershire area.